This Chilli Chicken is joining the rest. The rest of the Chinese or Indo-Chinese style chicken recipes I have already shared (Chinese Black Vinegar Chicken). More or less right? Chinese or Indo-Chinese style cooking? How different or what can be different for the ingredients, maybe some changes here and there, otherwise, its soy sauce, garlic, ginger, dried chillies (Honey Chilli Chicken, Sesame Chicken, Sweet Chilli Chicken & Chinese Herbal Chicken Soup) or those other required or sort of we tend to reach out to ingredients. Other than that? You tell me. Now, lets get going to making this Chilli Chicken. Chicken (Salted Egg Chicken, Chicken Kebab, Chicken Chop, Baked Cornflakes Chicken) and chillies (Chilli Lime Fish, Sichuan Chilli Prawns, Crispy Chilli Fish & Chilli Clams) obviously are the main highlight and we are going to use chicken fillet or only the meat or flesh. Plus cashew nuts for crunch and bite, oh, I also decided to add potatoes and like I have already told you earlier, the rest of the Chinese ingredients like ginger, garlic, shallots and soy sauce (Cashew Masala Chicken, Curried Roast Chicken, Chicken Varuval & Baked Lemon Chicken). When oil is heated, sauté ginger, garlic, shallots and dried chillies. Add chicken and cook for a couple of minutes. Pour in dark sauce, light sauce and season with salt (if needed) and pepper. Continue to cook till chicken is tender and sauce thickens. Add cashew nuts and potatoes. 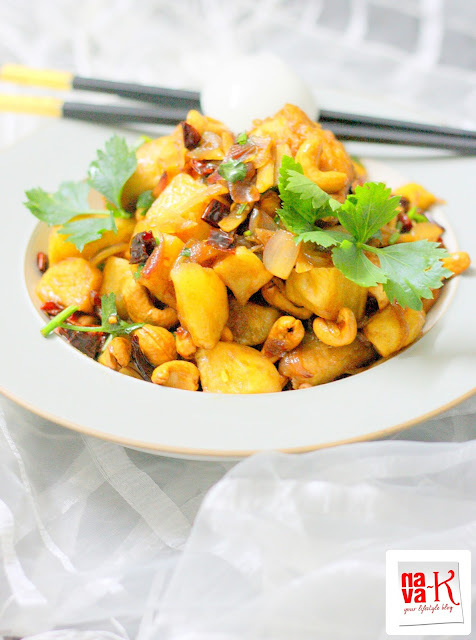 love that you added cashews for crunch, you need that in this kind of dish, awesome addition of potatoes, I am too fan of potatoes. Oh the chicken looks delicious Nava.. :-) We get this here too and I love it. Chicken with cashew is a popular dish, & I like the addition of potatoes. This simply turns it into a one-dish meal! chilly chicken with potatoes thatz an interesting combination. a little different from indian version.. like the color here.. tempting dear..
Hi Nava, this dish is very delicious and appetizing. Yours look awesome. Ya, the restaurant style of stir frying with high heat, we can't practice at home or else we will have a hard time cleaning the mess and oily too. But never mind, we can still enjoy the homemade version, still taste good and healthy. this is one of the most mouth-watering posts I have seen. Bello plato tentador se ve muy delicioso,saludos y abrazos. Nice clicks. 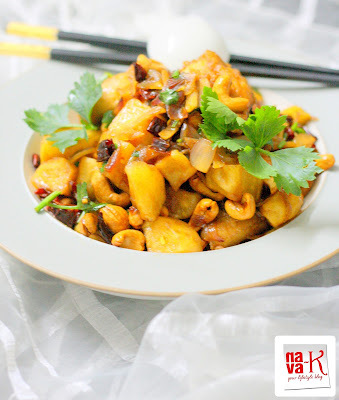 Chicken and cashew nuts are always a fun combination. The potato addition is different to the mix. A different version.. Love the colourful platter..
Chilli chicken looks yumm with lots of cashews and addition of potatoes. Splattering oil is always a problem for me too. That's a chilli chicken with a twist !! Cashews & potatoes generally do not appear in the version we get over here :) And as u said, cleaning up the mess is a great trouble which makes the attempt questionable ! that's a plate full of crunchiness... love it!!! if there is one thing i hate about cooking, it's definitely the cleaning!!! Mmm..would love to have that right now Nava.. This sounds great, like the use of the cashew nuts. I haven't had chilli chicken with potatoes and cashew nuts. Seeing your post title made me think...why haven't I thought about that before?? Looks delicious...and the crunch from the cashew would be lovely! Totally appetizing and healthy! I will skip teh cashew nuts because I don't do too well with cashew. I love how the chicken looks and the idea of adding potatoes to the dish was nice and would have made it more hearty. Yummm.